Madagascar day geckos (Phelsuma madagascariensis) are the largest species in their genus, reaching up to 10 inches in length. There are three distinct subspecies: Phelsuma madagascariensis grandis, Phelsuma madagascariensis boehme and Phelsuma madagascariensis kochi. These lizards have specific adaptations to their environment that are useful to their survival. 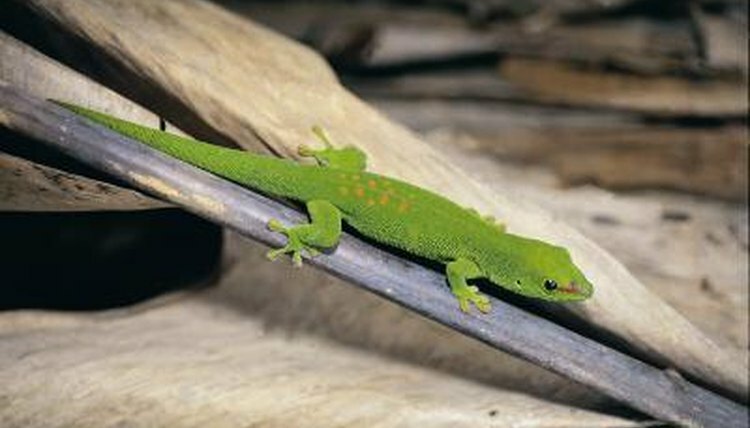 Madagascar day geckos are primarily bright green, with some rust or red markings. They're an arboreal species -- they spend the majority of their time in the trees -- so their bright green coloring helps to camouflage them amongst the leaves. This adaptation helps them to blend in with their environment and avoid ending up as someone's dinner. As Madagascar day geckos live most of their lives in trees -- mainly in tropical rainforests -- they need to be good climbers. They have large, flattened toe pads with special adhesive scales on their undersides, known as lamellae. These toe pads allow them to grip onto smooth surfaces and climb vertically up trees and vegetation. Being an arboreal species means they can escape most ground predators and minimize the number of creatures that consider them food. The majority of Madagascar day geckos' diets are made up of various arthropods, such as insects, crabs, spiders and scorpions. However, they're also happy to eat honey, nectar and sweet fruit. This means that they can almost always find something to eat. When insects and other arthropods are scarce, they have another good source of food to forage for. Madagascar day geckos are are diurnal, which means they're active during the daytime, whereas many other gecko species are nocturnal -- or active at night. One specific adaptation to their eyes allows them to see better in daylight; these geckos have large, round pupils, while nocturnal geckos have small, slit-like pupils. As cold-blooded creatures, they get their heat from the sun, so an advantage of being diurnal is they can bask and take in warmth and energy.